What's the weather going to be like today? For a cyclist, especially an everyday commuter, the weather can have a profound effect on your day. 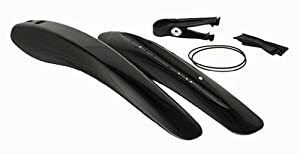 Fair weather riders need not worry about fenders too much, but those foul or fair riders will want to invest in a good set of fenders to keep themselves and their bike clean. In case you don't know already, fenders cover the wheels of the bicycle. When the tires get wet and spinning, the inevitable water spray will occur. Uncovered, the rear tire will give you a 'skunk stripe' up the center of your back, and the front wheel will spray onto your face and into your mouth sometimes, too. It's just lovely! With fenders, you'll avoid getting covered in muddy water from the road. This will not only keep your clothes clean, it will also protect your bicycle. 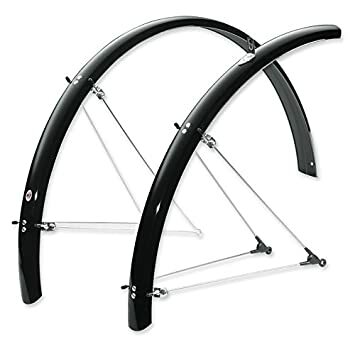 Every cyclist can benefit from a set of fenders. Full wrap fenders provide the most wheel coverage, and will keep you the cleanest. However, not all bicycles can be outfitted with the full wrap fender variety, in which case, clip on fenders will do nicely, instead. We have both types of fenders in stock here at Eddie's. We have fenders from SKS, Planet Bike, Crud & ToPeak. "The Crud Raceguards are very flexible, durable fenders, and a shop favorite!" The front fender is a downtube fender, and the rear attaches to the seat post. Its not full front wheel coverage, but it works quite well. The ToPeak fender set is great for bicycles with suspension forks! The rear clips to the seat post, and the front fender inserts into the steerer tube. Full wrap fenders provide the most coverage, but they won't necessarily work on every bicycle. If you are unsure, bring your bike in and we'll check everything out for you.